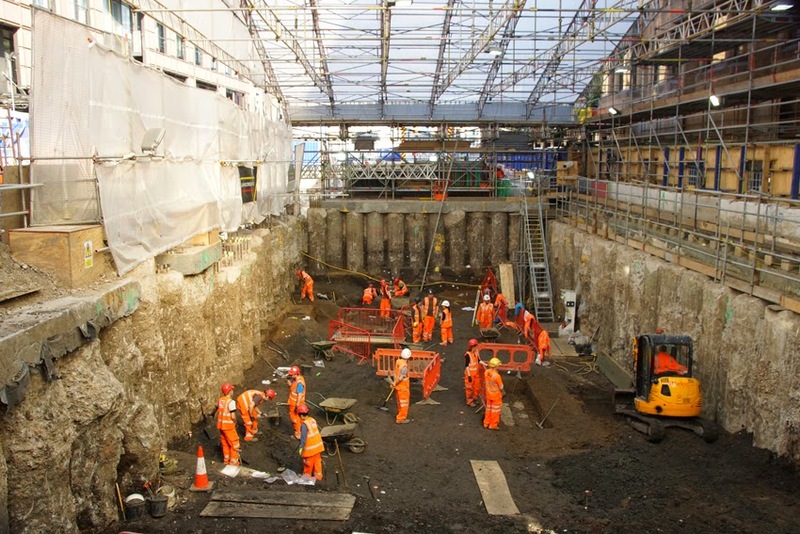 As Crossrail progresses, so does its archaeology programme. 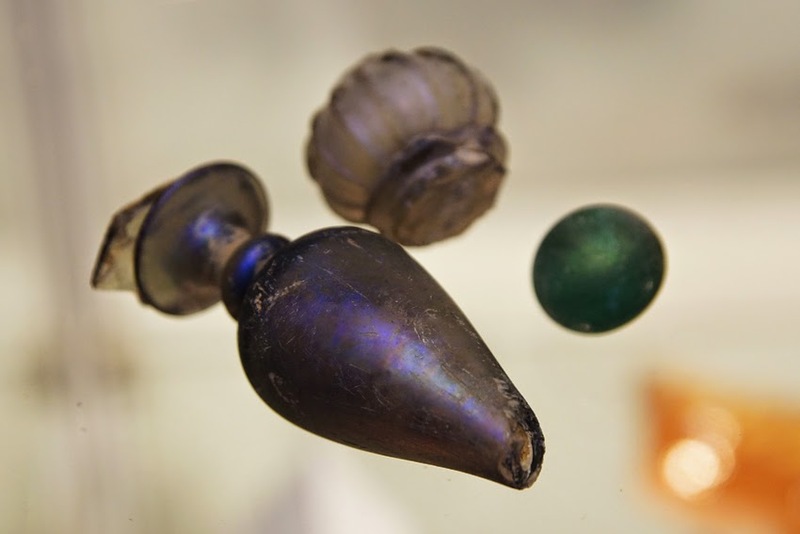 The dig at Liverpool Street has been featured in the news recently, thanks to its discovery of the Bedlam burial ground. (This was not for residents of the notorious hospital, but being unattached to any particular church attracted a diverse range of Londoners). Attention-grabbing they might be, but those three thousand bodies aren't its only finds of interest. 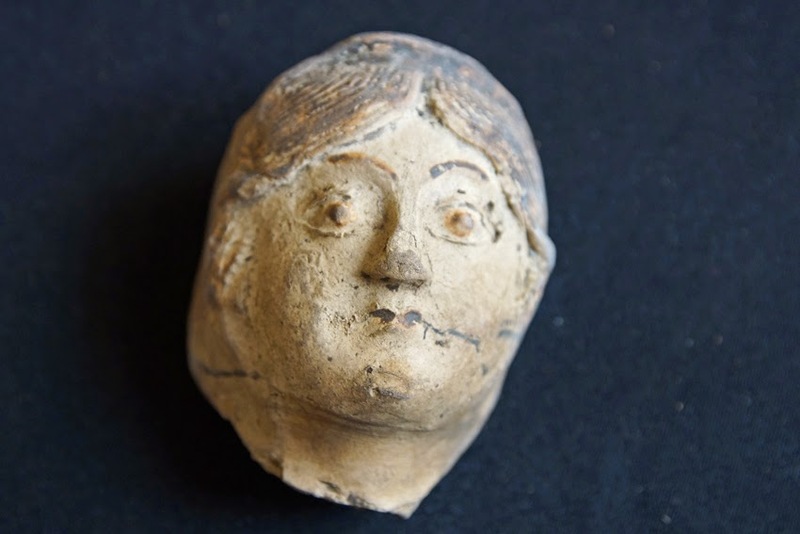 The excavation has continued down into the mediaeval and Roman levels, and when I visited with London Historians last week, we were lucky enough to see some of the most recent finds. They might not have quite the impact of all those skeletons, but they are pretty wonderful in their own right. 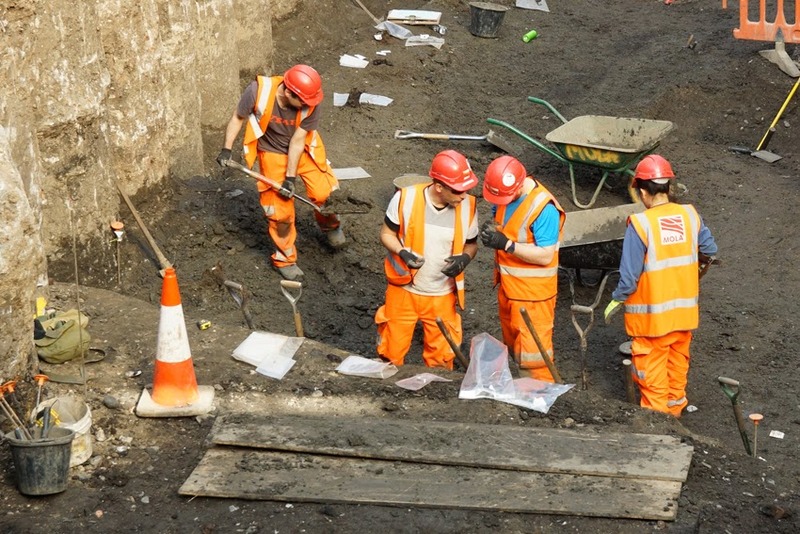 With a railway to build, the time for excavation is strictly limited. 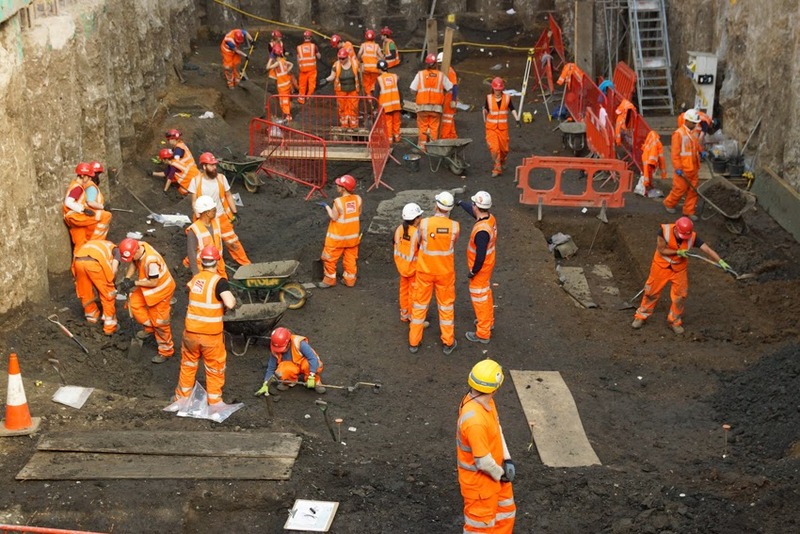 At Liverpool Street, archaeologists are working in shifts until 11pm at night, so there was still plenty of activity during our early-evening visit. Viewing windows in the hoardings, and regular opening times, allow the public to follow the work - and a lecture programme starts next month. George Funnell, a 33-year-old ex-soldier turned police constable, was on his beat in Hackney when he noticed a fire in the Elephant and Castle pub on Wick Road. After raising the alarm, he rushed into the burning building: the landlady and two barmaids were still inside. First he brought out the landlady, then one of the barmaids. Now burnt himself, he nonetheless went back in for the third woman. PC Funnell reached the woman, and directed her to a back door. However, he himself was overcome by the heat and smoke. The woman escaped into the street, but by the time rescuers reached Funnell he was unconscious and burned on the face, neck and arms. Eleven days later, on 2 January 1900, he died of his injuries. GEORGE STEPHEN FUNNELL - POLICE CONSTABLE - DEC 22 1899 - IN A FIRE AT THE ELEPHANT & CASTLE, WICK ROAD, HACKNEY WICK, AFTER RESCUING TWO LIVES, WENT BACK INTO THE FLAMES, SAVING A BARMAID AT THE RISK OF HIS OWN LIFE. 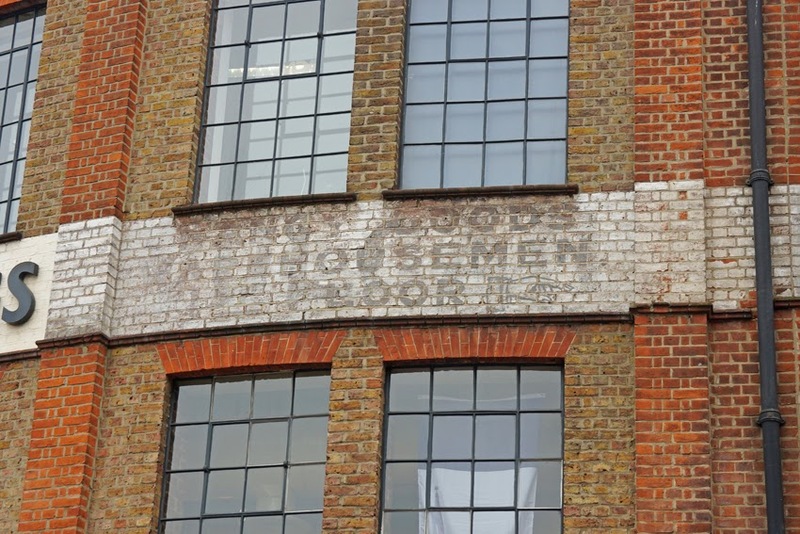 Although this old advertising sign is on the wall of a building in Ealing Broadway, it is not painted on brick but on tile. 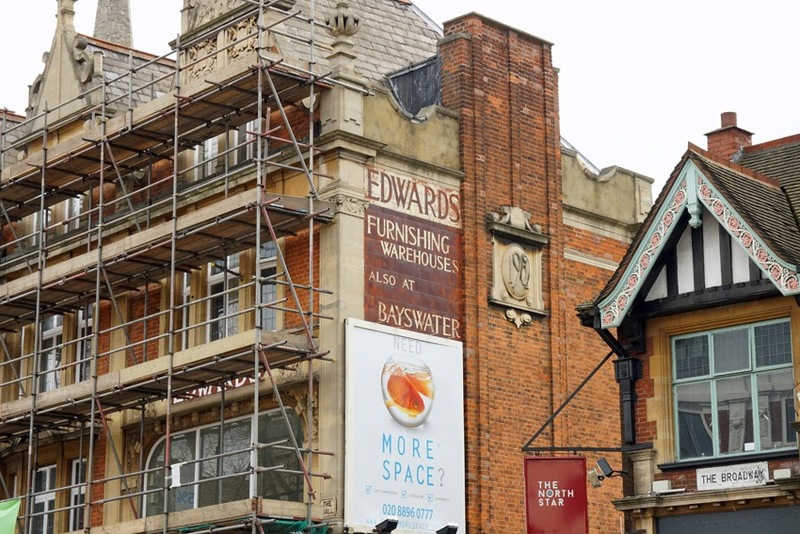 It has outlasted the furniture store on whose wall it was placed - as has a smaller sign on the facade, currently largely obscured by scaffolding. 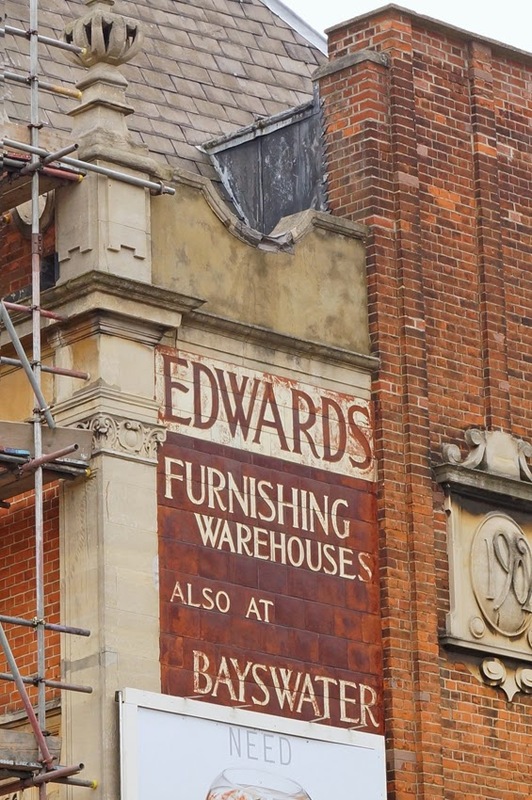 Today, the sign states that 'Edwards Furnishing Warehouses' are 'also at Bayswater'. However, without the advertising hoarding - that curse of the ghost sign lover! - we would be able to see that they were at Kensington and Acton too, with workshops on Porchester Road. Police Constable Alfred Smith was killed during an air raid while evacuating a street in Finsbury and ensuring that women from a factory took cover. 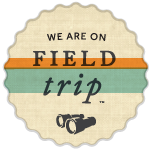 The date may be a little surprising, though: 13 June 1917. While air raids over London are associated with the Second World War, there had been some during the 1914-18 war too, mainly carried out by Zeppelins. The first raid on London took place on 31 May 1915 in the East End, killing six people. Defences were soon improved and blackout regulations put in place. Losses of Zeppelins were heavy. However, 1917 saw a new form of attacker: squadrons of Gotha aeroplanes. Casualties were much higher than those for Zeppelin raids; London's first and worst was that which killed PC Smith. He was one of 162 dead, with many more wounded. The attack had taken place in broad daylight, when streets and buildings were busy - among the casualties were 16 children killed by a direct hit on their school. Only one of the squadron of 22 aeroplanes which made the attack was brought down. The air raid of 13 June was to have two unintended effects. First was the strengthening of the RAF, which led to heavy losses of Gothas and the end of daytime bombing. The second unexpected consequence was that rather than destroying morale, the attacks on civilians increased popular hostility to the Germans. Overall, the effect of air raids on Britain in World War One was of limited military significance - a fact which perhaps makes the loss of life even more poignant. On 19 January 1917 at 6.52pm, the Brunner Mond munitions factory explosion claimed the lives of 73 people in Silvertown, east London - the youngest only 4 months old. When a fire broke out in the melting pot room on 19 January, 50 tons of explosive ignited, destroying the factory and surrounding buildings. The explosion was heard 100 miles away, and burning debris was thrown for miles, starting further fires: a gasholder on Greenwich Peninsula was ignited and threw a huge fireball into the air. Hundreds of people were injured and thousands were left homeless. The exact cause of the fire is not known, but it was probably due to inadequate safety standards. 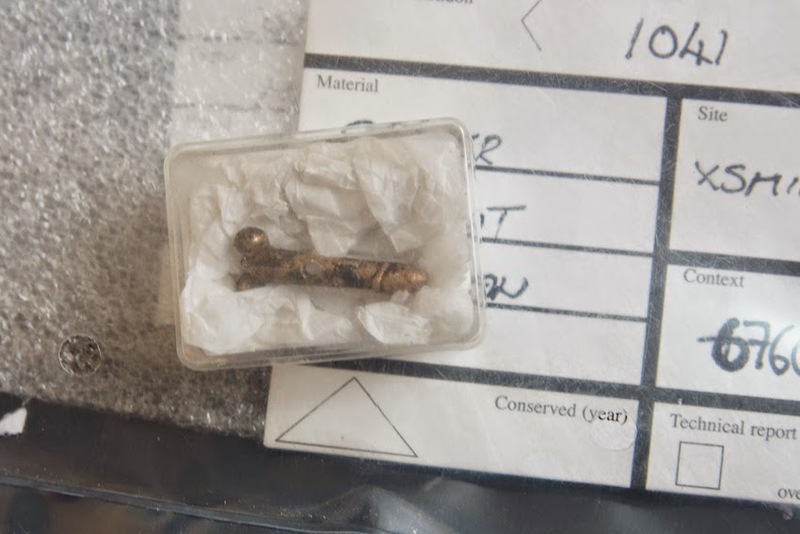 A government report produced after the disaster (but not released until the 1950s) referred to TNT in torn bags and packages with missing stoppers; production and storage were in the same building. Tragically, a second, much larger (and safer) TNT factory had already been opened; its higher production made the Silvertown factory unnecessary. 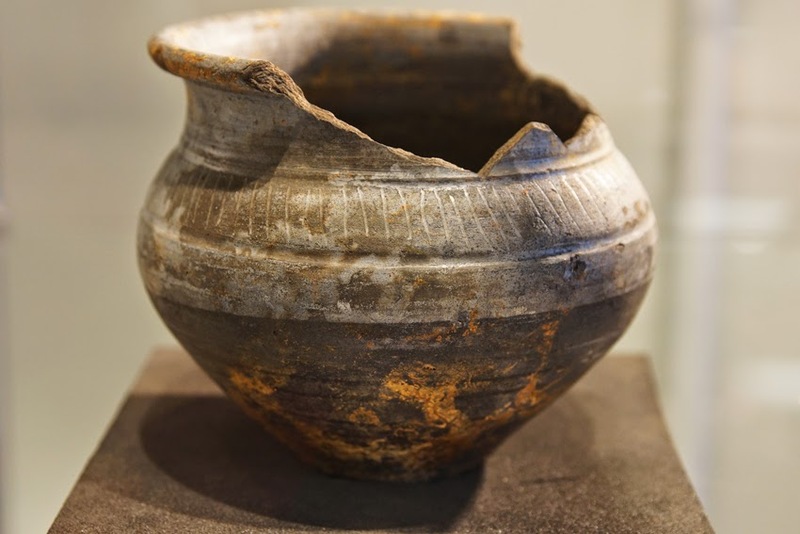 Nonetheless, the government insisted on keeping it open, with disastrous consequences. The site of the destroyed factory has not been built upon to this day: it is now a car park. Among the dead was Dr Andreas Angel, an Oxford professor doing voluntary war work as the plant's chief chemist; he was attempting to help put out the fire. Station Officer S Betts and Fireman Yabsley were killed as they prepared their hoses to tackle the blaze, despite knowing the risk of explosion. The Watts Memorial commemorates a further casualty, PC Edward Greenoff, who helped to evacuate the factory. Aware of the imminent danger, he nonetheless remained outside to warn passers-by of the risk of an explosion. When that explosion did take place, the head injuries he suffered proved fatal; he died nine days later, aged 30. He was posthumously awarded the King's Police Medal. At the time of his death, PC Greenoff had an eight-year-old son, Edward, who would later become a police officer himself. P.C. EDWARD GEORGE BROWN GREENOFF - METROPOLITAN POLICE - MANY LIVES WERE SAVED BY HIS DEVOTION TO DUTY AT THE TERRIBLE EXPLOSION AT SILVERTOWN 19 JAN 1917. Now a Wetherspoons pub, the Rodboro Buildings in central Guildford wear the marks of their industrial past. 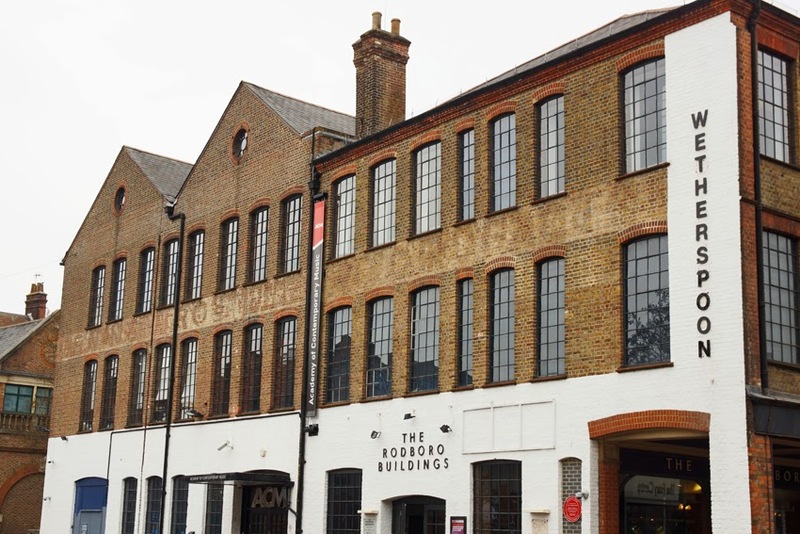 The structure was built in 1900 as the Dennis Brothers car factory: the Borough Council claim it as the oldest surviving car factory building in the country. The brothers had begun by making bicycles, before building their first car in 1899 and launching car production in the new premises soon after. Lifts took the cars from floor to floor - they were finished under natural light on the top floor before returning back to earth to take their place in the ground-floor showroom. Commercial vehicles were soon added to the range, and Dennis would become best-known for buses and fire engines - unsurprisingly, bigger premises on the outskirts of town were soon needed. As car production trailed off, the company left this site in 1913. The faint ghost signs stretching along its facades witness to their time here, though. 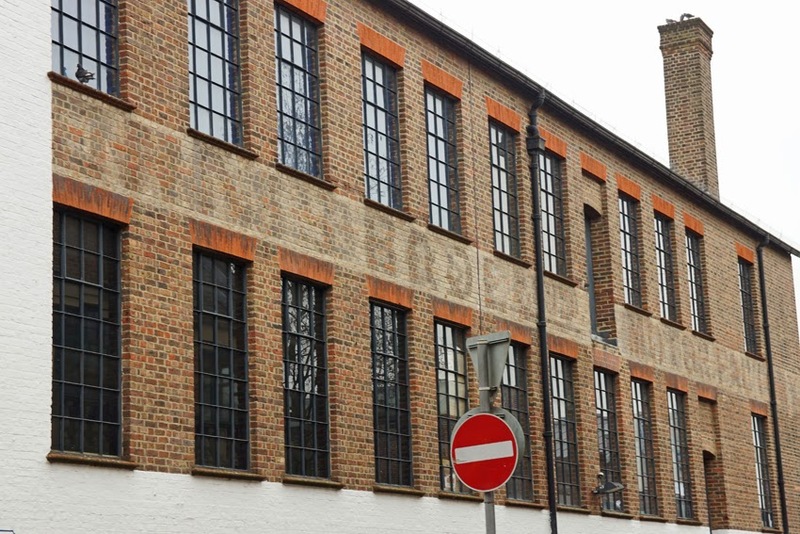 One (below) reads 'Dennis Bros Ltd Motor Factory', somewhat unclearly as it has been repainted several times. The other (above) is harder to decipher, but includes the words 'Dennis Bros' and probably 'Factory'; the intervening words are obscure. The building's name comes from the Rodboro Boot and Shoe Company, who were here from 1919-1928. 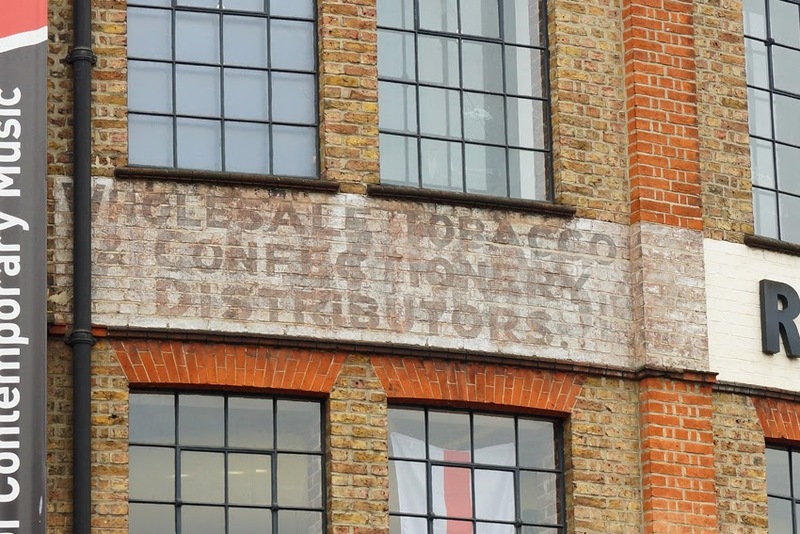 They were followed by a confectionery warehouse, from whose time we have a sign advertising 'wholesale tobacco & confectionery distributors'. Nearby is another small panel, with manicule, directing 'Fancy Goods Warehousemen [?] Floor'. It's lovely to see so many traces of the building's diverse history so visible. And it's hard not to be impressed by a ghost sign, however faint, that has survived for a century!